After a long hike to Waimea Canyon at what felt like the crack of dawn, our hiking group decided we needed some refreshment. 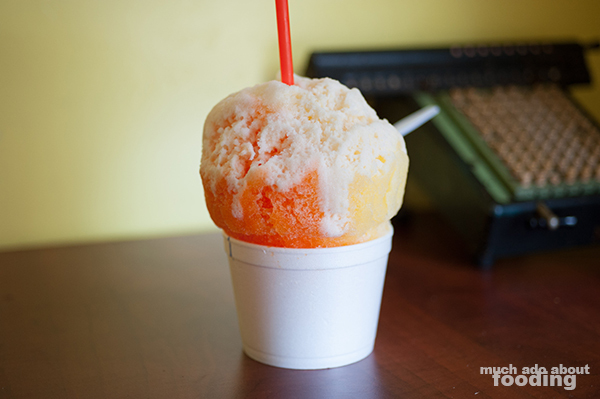 Since it was Duc's and my first time to Hawaii, our friend insisted we get some shave ice. 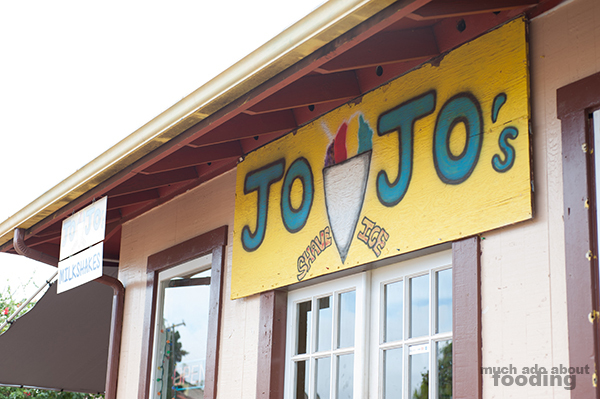 The welcoming sign at Jojo's drew us in as did their boasting being in Waimea since 1992! If it's still around after more than 20 years, it's got to be solid right? 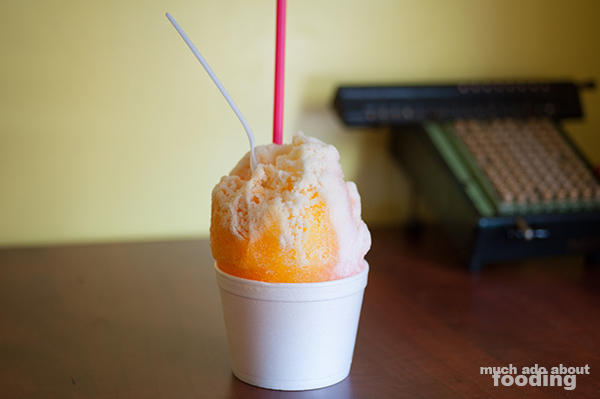 The shave ice shop itself looks just like a converted house from the outside. 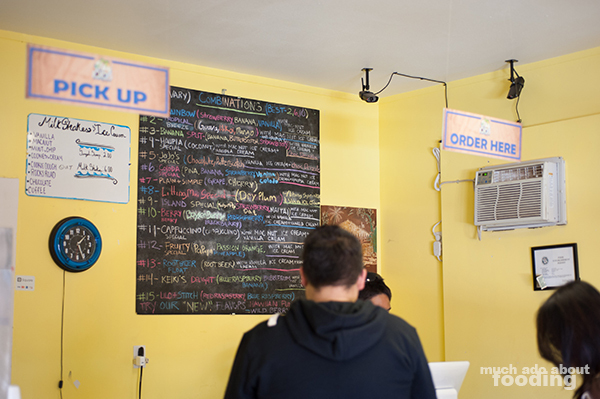 Inside, it's bare bones but that's not a problem because the dessert itself seems like a to-go type of thing. There were several combinations to choose from and quite the friendly staff! We were engaged right away by the young guy working up front who welcomed us and immediately started asking if we needed assistance. Easily he ran through the menu which consisted of many preset combinations but also pointed out that we could build our own concoctions. In regards to single flavors, we saw nearly 60 selections in addition to their nearly 20 combinations. You definitely have a lot of options here. While we tried to make our decisions, the atmosphere was fun and lively with pop rock music through the speakers and the vibrant colors of the place. 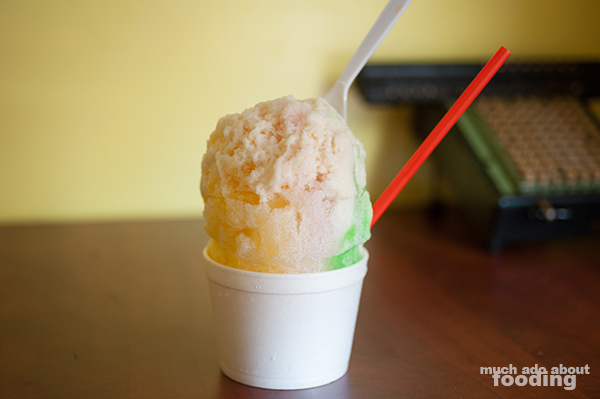 Decisions made - we opted for the Fruity Special (papaya, passion orange, pineapple, and macadamia nut ice cream), North Shore (pineapple, melon, lychee, macadamia nut ice cream, and haupia cream), and Tropical Breeze (guava, lilikoi, mango, and macadamia nut ice cream). Unfortunately the photos seem all very similar and not very exciting looking but getting these giant bowls which were their Regular size at $5.50 each was probably just as energizing as it would be to a child. The ice was finely shaven and therefore started melting quite quickly but that gave us more incentive to eat faster. Overall, we found the flavors to be not as distinct in tastes as we thought they'd be but the ice cream at the bottom was superb. All of us enjoyed the mac nut ice cream which is the true prize after digging through all the shave ice. 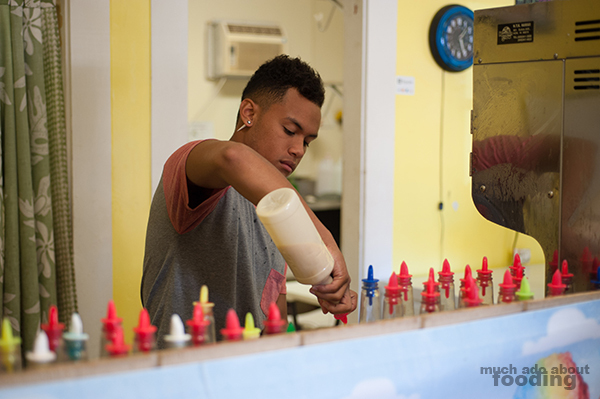 If you're going to stop by here, come in for the good vibes and great ice cream. Maybe the top part (the ice) just isn't our thing!